Liverpool forward Mohamed Salah's virtuoso display in the 5-2 win over AS Roma on Tuesday brought his side to the brink of the Champions League final and posed a serious threat to Lionel Messi and Cristiano Ronaldo's grip on the Ballon d'Or award. The Egyptian scored two brilliant goals in the first half against his former club to set Juergen Klopp's side on their way to victory in the semi-final first leg at Anfield. He set up two more in the second half to cap a thrilling evening. Salah's importance was further demonstrated by the fact Roma scored the two goals that give them a slither of hope of turning the tie around after he had been substituted. The Egyptian's strikes brought him to a remarkable 43 goals in all competitions this season, keeping him at the front of the list of top scorers in Europe, one ahead of Real Madrid's talisman Ronaldo and two ahead of Barcelona's Messi. The Spain-based duo have had a stranglehold on the prestigious Ballon d'Or award since 2008, each winning the trophy for the world's best player five times. But Salah's decisive performances are threatening to break that hegemony. Since signing from Roma last season, the 25-year-old has already equalled the Premier League record for goals in a 38-game season with 31. He also recently pipped Kevin de Bruyne, Leroy Sane and David Silva of runaway champions Manchester City to the PFA Player of the Year award. 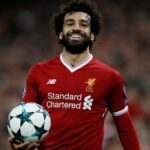 His manager Klopp encouraged reporters to stake Salah's claim as the best in the world while admitting he faces serious competition. "If you think he's the best in the world, write it or say it," said Klopp. "He is in outstandingly good shape, in world-class shape, 100 percent. To be the best in the world you need to do that over a longer period, I think. There are a few others who are not too bad." The Ballon d'Or has gone to a winner of the Champions League for the last four years and Liverpool may have to lift a sixth European Cup in Kiev if Salah is to usurp double holder Ronaldo, whose Real side face Bayern Munich in the other semi-final. Messi could also stake his claim to win the award for a sixth time with an influential performance for Argentina at the World Cup. But Salah will also be in Russia, the leading light of an Egypt team making their first appearance in the tournament for 28 years. If Salah leads Egypt out of Group A and steers them towards the quarter-finals, he will be able to make an even stronger case to prise the highly coveted individual award from the two greats of the game.